Finely slice fresh pineapple and simmer in sugar syrup for 10 minutes. Cool, then pat excess syrup with a paper towel. Lay pineapple slices on a baking tray and dry at 100°c for about an hour. Bring 1 litre of water to approximately 80°C and brew tea for 5 minutes. Strain and chill. To a martini shaker with ice add 1 part tea, 1 part Granny Smith juice and sweeten with a little of the pineapple syrup to taste. 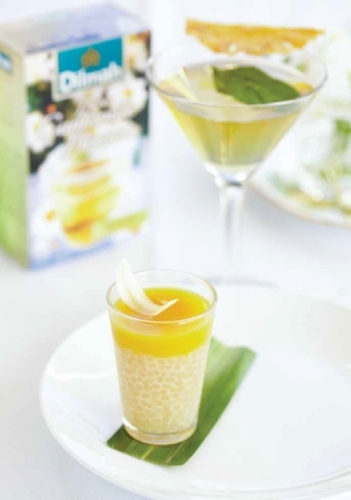 Stir and strain into martini glasses and garnish with fresh mint and a pineapple chew.